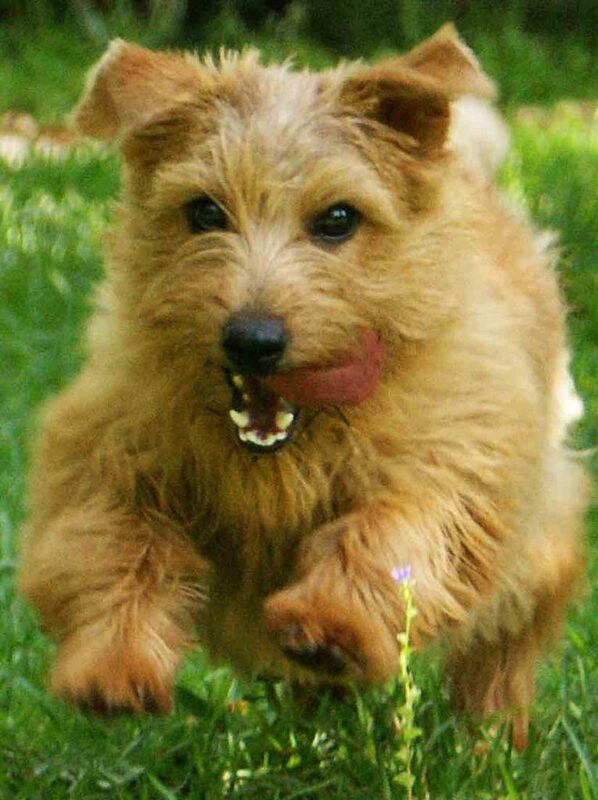 Norfolk Terrier is a separate dog breed from the Norwich terrier since 1963. 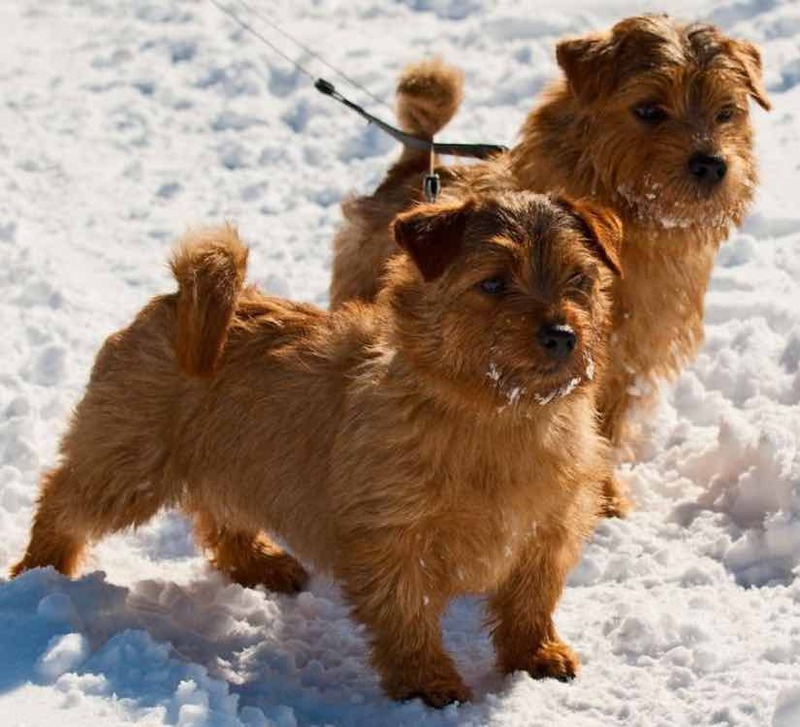 For many years, the Norfolk was the drop-eared version of the Norwich Terrier and shared its background, supposedly that of small Irish Terriers crossed with Border Terriers and Cairn Terriers. For 30 years, the two ear types – drop and prick ears – were shown together in competition and interbred. However, interbreeding created problems with ear carriage so in time only prick ears were bred to prick ears and drop ears to drop ears. Within a few generations, two distinct breeds emerged. 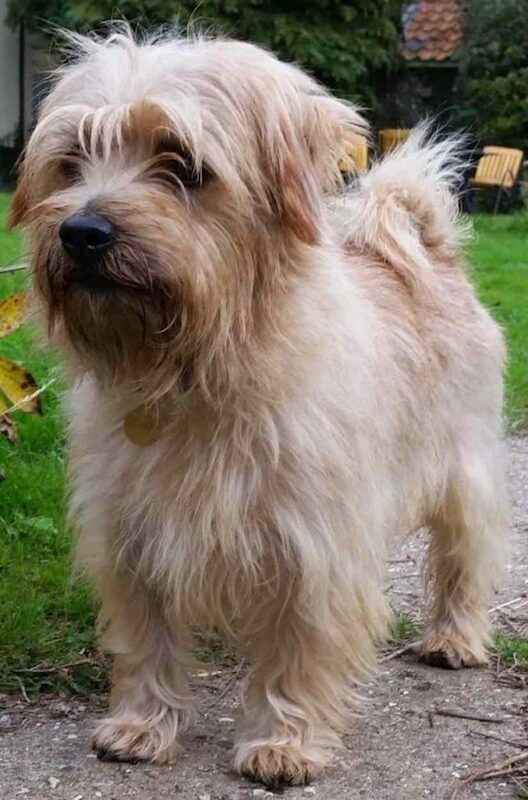 Promoters of the drop-eared dogs applied for separate breed classification and in 1963, The Kennel Club (England) granted it under the new breed name of Norfolk Terrier. This alert, fearless and independent little dog breed is a ‘demon’ for his size. He has a lovable disposition and a hardy constitution. He’s a delightful, perky companion in the home. 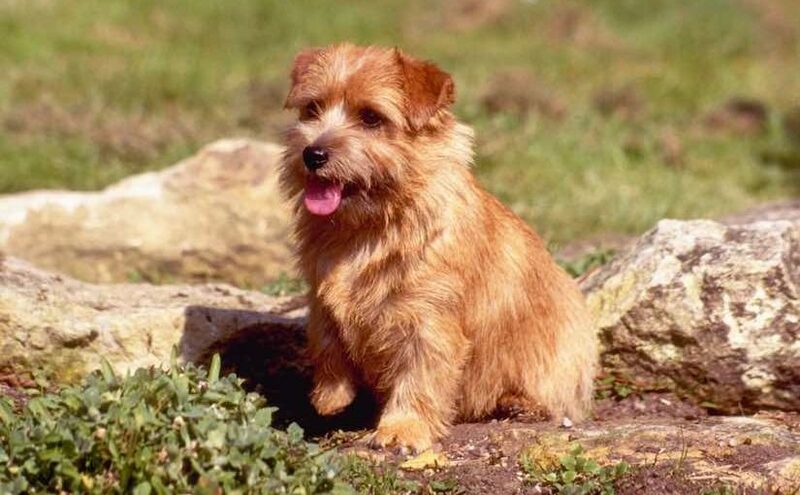 General Appearance: The Norfolk Terrier is one of the smallest of the Terriers, but a “demon” for its size. Of a lovable disposition, not quarrelsome, with a hardy constitution. A small, low, keen dog, compact and strong with a short back, good substance, and bone. Honorable scars from fair wear and tear should not be penalized unduly. Ideal height 10 inches (25 cm) at withers. Coat and Color: Coat is hard, wiry and straight, lying close to the body. It is longer and rougher on the neck and shoulders. The hair on the head and ears is short and smooth, except for slight whiskers and eyebrows. 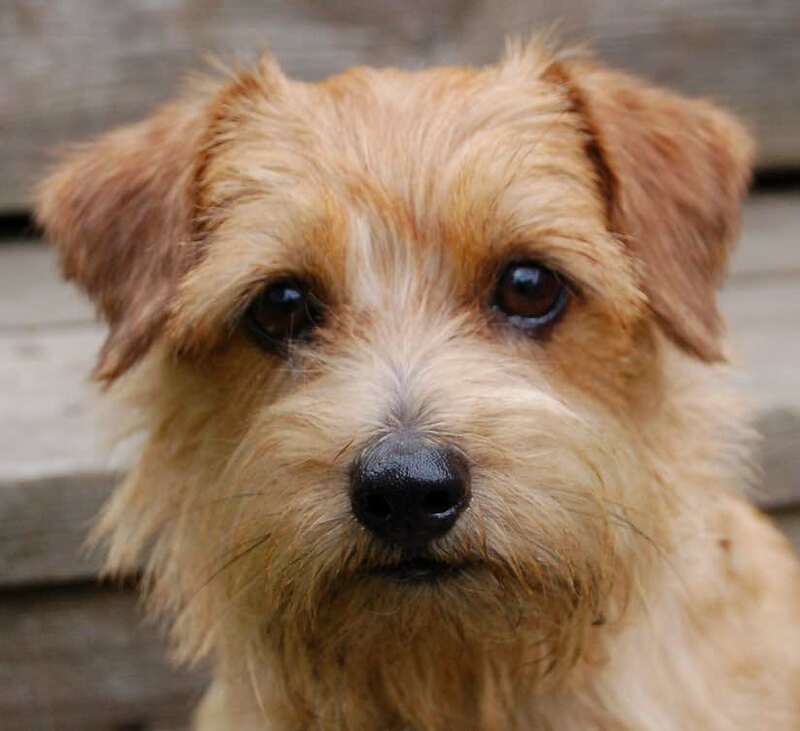 Color: all shades of red, red wheaten, black-and-tan, or grizzle. White marks or patches are undesirable but shall not disqualify. Head: Skull wide and slightly rounded with good width between the ears. Well defined stop. Muzzle wedge-shaped and strong; length of muzzle slightly less than half the length of the skull. Mouth tight-lipped, jaw strong; teeth strong and rather large; scissors bite. Eyes oval shaped and deep set, in color dark brown or black. Expression alert, keen and intelligent. Ears medium sized, V-shaped but slightly rounded at the tip, dropping forward close to the cheek. Neck: Medium length and strong. Forequarters: Clean powerful shoulders with short, powerful and straight legs. Body: Compact with a short back, level topline, well-sprung ribs. Hindquarters: Well muscled, good turn of stifle, hocks well let down and straight when viewed from the rear; with great powers of propulsion. Feet round with thick pads. Docked: Medium docked, set level with the top line and carried erect. 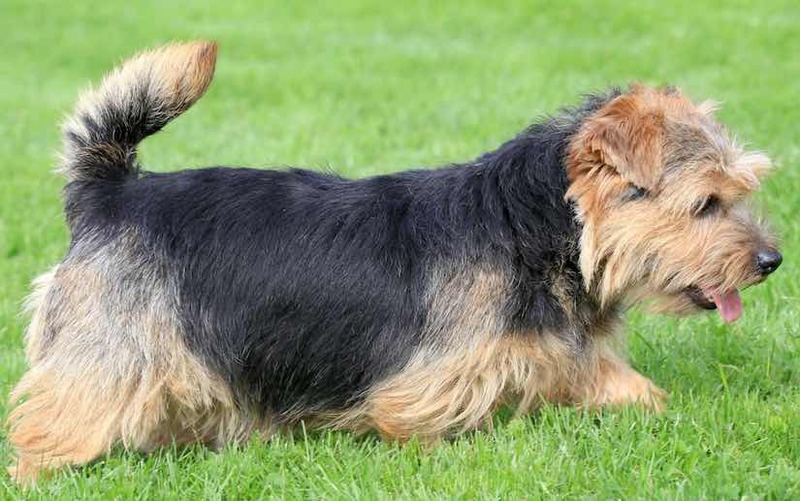 Undocked: Tail of moderate length to give a general balance to the dog, thick at the root and tapering towards the tip as straight as possible, carried jauntily, but not excessively gay. Gait: Should be true, low and driving. In front, the legs extend forward from the shoulder. Good rear angulation showing great powers of propulsion. Viewed from the side, hind legs follow in the track of the forelegs, moving smoothly from the hip and flexing well at the stifle and hock. Top line remains level. Faults: Consider any departure from the above points as a fault with seriousness exactly in proportion to its degree.